The Meg is based on the novel by Steve Alten. While most of the world believes that the Marianas Trench is the deepest part of the ocean, a group of scientists at a state-of-the-art research facility have another theory. They believe they have found a deeper part of the ocean isolated from the rest of the world by a thermal layer. As they investigate it for the first time, they find an amazing world full of creatures undiscovered by mankind. But they find something else as well. While exploring this new realm, their submersible is attacked by a megaladon – a prehistoric shark thought long extinct. As the explorers lay trapped on the sea floor in their damaged submarine, the rescuers on the surface reach out to the one man they believe can help them – Jonas Taylor. And it just so happens that he has had an encounter with a megaladon in the past, yet he was dismissed as a crackpot. Jonas and the scientists undertake their rescue mission but in the process unwittingly unleash the megaladon on the world above. But can they stop it before it wreaks havoc on the unsuspecting nearby public? The Meg is rated PG-13 for action/peril, bloody images and some language. I was really looking forward to The Meg having read Steve Alten’s book when it came out in 1997 and followed its long, long development process. I’m also a fan of monster movies and shark movies, so this was right up my alley. So I was happy to see it finally hit the big screen. Was it worth the wait? Yes and no. Tonally The Meg wavers a bit. On the one hand it plays everything serious despite the ridiculous premise, much like the original Godzilla movie. On the other hand, it knows it is ridiculous and it has fun with it like Tremors. It never gets to Sharknado levels of absurdity, but it does have fun with the fact that the centerpiece is a massive shark. In fact, I think it needed to have a bit more fun with that. The Meg is at its best when it does what you expect it to do – kill swimmers in horrible and darkly ironic ways. There are some fun kills in the film which I won’t spoil here. 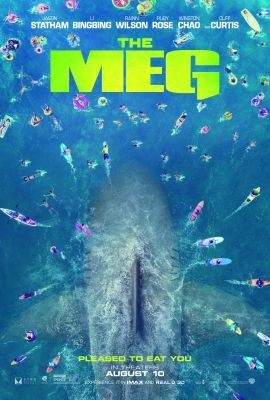 It does feature a couple of twists and turns that are surprising, but the highlight of the film is when the Meg turns a beach full of swimmers into his own personal buffet. That’s when you get the best action, the best kills, and most of the fun moments; and the movie needed more of that. The cast of The Meg is full of fan favorites. Jason Statham leads the cast as Jonas Taylor and he does a great job. Fans of his may find him to be the best part of the film, he sells the ridiculous concept and makes it entertaining. Rainn Wilson is the billionaire financier Morris. While he’s not Dwight Schrute levels of evil, he is the biggest villain of the film next to the shark. Cliff Curtis from Fear the Walking Dead plays Mac and he’s well paired with Statham. Though he’s quite serious on the zombie TV series, he actually brings a bit of comic relief here. However, Page Kennedy is the real comic relief as DJ. His reactions to the Meg and the situations they are in bring much needed laughs. But Sophia Cai really steals the show as Meiying. She’s smart, funny, and has some fun moments with DJ. Masi Oka from Heroes has a small role as Toshi. Finally Ruby Rose shows promise as Jaxx. She’s tough and smart and well suited to play the engineer character in the film. The Meg was heavily financed in Asia and it’s quite apparent in the film from the actors to the locations. And while it’s a bit too in-your-face at times as a way to satisfy investors, it adds an extra dimension to the story which it might otherwise not have. We see Jonas in Thailand drowning in his sorrows. We see an international cast of characters in all sorts of roles. We see the Meg terrorizing a Chinese beach packed with interesting characters. It gives a unique feel to the story that we might not have had if it was set in California. It’s cliché to say the book was better than the movie, but in a few ways that’s the case with The Meg. The book opens in the Jurassic era and shows a megaladon attacking a T-Rex (I have no idea why you wouldn’t include that as your opening scene other than budget concerns) and also ended with Jonas being swallowed whole by the megaladon and then the hero cutting his way to the shark’s heart from the inside and killing it. That was way better than what was in the movie as well. So there just seemed to be some unusual choices made in the departures from the novel. As previously mentioned, The Meg has tonal issues. There are long stretches where it is flat out dull, most of which are where the story tries to be serious. It’s usually when Winston Chao as Zhang lectures about man vs. nature or when he has a tender moment with Bingbing Li as his daughter Suyin. It feels a lot like Godzilla where you want to fast forward through the serious moments and get to the monster destroying things. I would never compare The Meg to Jaws but here I am comparing The Meg to Jaws. In Jaws there was a lot of suspense built up any time the shark was not on the screen. The moment someone set their foot in the ocean or even were about to get in the water, you held your breath. There is none of that suspense in The Meg. 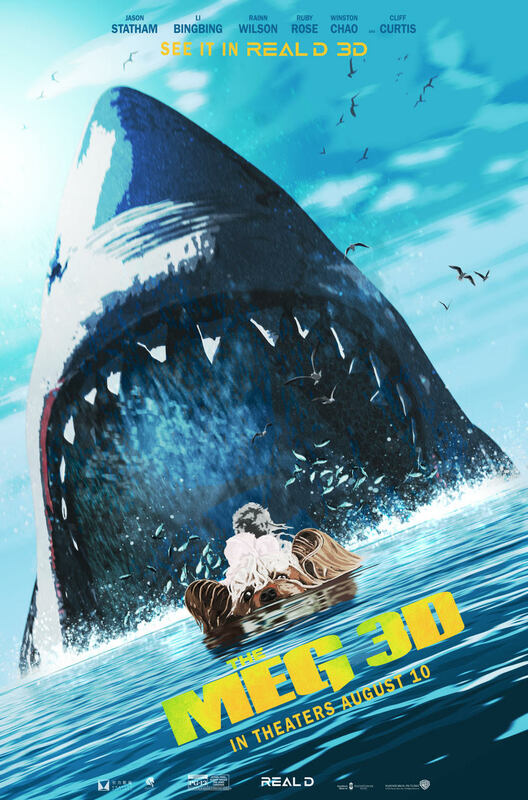 The characters pull up in their boat to the site of a shark attack, see the megaladon swimming nearby, and then proceed to act as if they’re on a leisurely fishing trip. You would never dream of getting in the water in an inflatable dinghy with Jaws. With Meg, the characters don’t think twice about it. There’s zero menace built up around the shark and it’s terribly disappointing. The visual effects for The Meg are also mediocre. The shark looked a bit like a CG blob and never felt all that real. I was looking for “Shark Week” levels of realism, not Sharknado. Finally, this movie was rated PG-13. I understand why they did it. They want as big an audience as possible seeing this film. But I think The Meg needed more spectacular and shocking kills like Deep Blue Sea, and that would have pushed it into R territory. I think they should have considered that to give it the additional edge that it needed. If you like monster movies, shark movies, or Jason Statham movies, then The Meg is well worth checking out on the big screen. And if you’re looking for a dumb, fun, summer popcorn flick, it will also fit the bill. But ultimately The Meg may only inspire you to go back and watch Jaws, which isn’t a bad thing either. The post The Meg Review appeared first on ComingSoon.net.